If you’re looking for a cuddly sweater that will keep you warm until after the autumn and winter drizzle is over, MADEO seems a most advisable pick to meet this purpose. Contrary to what we may initially think, the piece will turn out to be cut-out for truly feminine looks, appropriate to be coupled with other casual items. Available in two colour versions. 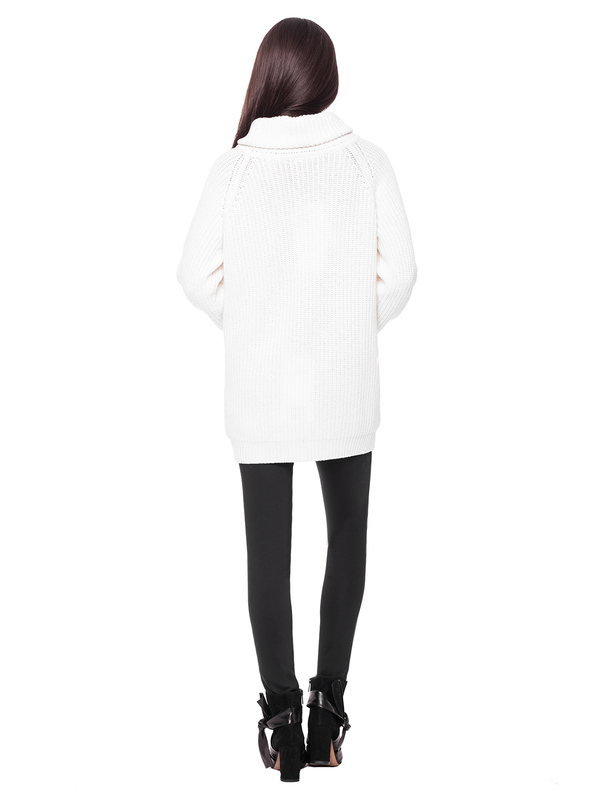 Go for a snow-white or black version of MADEO sweater to stay cosy and feminine on nippier days. Decorated with a broad collar or subtle embroidery at the bust. Slightly loose fit at the top part of the garment, a subtle flare towards the bottom. Casual, ‘household’ set will go well with leggings or jeans in a light colour. If you decide to wear MADEO for the office or a party, combine it with skirts or classic fitting trousers. When it comes to hairstyle, combing your hair up seems a nice idea. Put emphasis to the waistline and voila, you’re ready to steal the show.